the small guide site's blog of English lessons: You bet. "You bet" is a short sentence that means "Absolutely!" or "That's right!" or "You'd better believe it." This expression is actually short for "You can bet on it," or "You can bet your money on it." Basically, if you believe or agree with something very strongly, you can say, "You bet." B: You bet I'll be there. Alternatively, you can also say, "You'd better believe it." A: So, are you ready to jump into the river? B: You bet I am. Let's do it. Look. I can't help you right now; I'm really busy. But if you asked me for help tomorrow, would I do it? You bet! I just can't do it right now. The TOEFL is a tough test, and you need to work hard. But if you're wondering if I think you can get a score of at least a 100. You bet! It's absolutely possible. 5. Sometimes, you may hear someone say, "You betcha" instead of "You bet." This is just a very informal way of saying this expression. The word "betcha" actually doesn't exist. It's short for "You bet your ..."
If you could, would you quit your job and travel for a year? You bet I would. or You betcha. I took this photo in a subway train in New York City. The Long Island Railroad (LIRR), which takes commuters from Long Island into New York City, stops at Penn Station. The MTA, the organization that runs the subway and commuter railways in the city and surrounding areas, is basically building and extending subway lines. 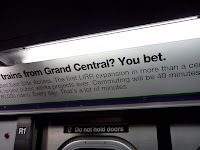 This ad, which I took inside the train, basically informs people that the LIRR will soon be stopping at Grand Central Station, as well, soon. The full question on the ad says, "LIRR trains to Grand Central? You bet." I'm sure a lot of commuters can't wait.